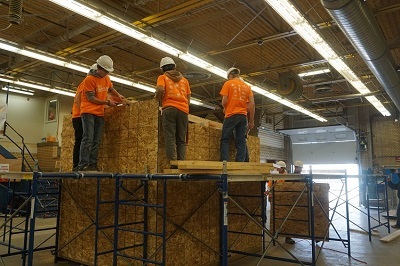 As reported on DiscoverMooseJaw.com, Think Construction is an annual event hosted here in Moose Jaw, where numerous organizations come together to engage students in empowering them to make choices for their career path as they’re leading on to graduation. It coincides with Construction Week, an appreciation of one of the largest industries in Saskatchewan. The construction industry has over 10,000 new entrants expected to enter the skilled trades in Saskatchewan over the next decade, and currently has over 50,000 people employed in Saskatchewan, almost equal to manufacturing, mining, oil and gas, and forestry combined. Prairie South School Division partnered up with All in All Construction in Moose jaw, Saskatchewan Construction Association, Saskatchewan Safety Construction Association, and Saskatchewan Apprentice, to put on the Think Construction event here in Moose Jaw. Think Construction is gives more hands on engagement before students make their choice about post secondary education, with first hand knowledge of the industry before they make those choices. Students from all over Prairie South School Division came to the event, and learned skills in electrical, plumbing, construction, and safety.